The cost of higher education in the U.S. today is ridiculous. Student debt shot north of $1 trillion earlier this year, for example. It’s not surprising, then, that the adoption of web and mobile learning tools is skyrocketing, toppling old modes of learning and creating new ones. There is no better, more relevant example than “MOOCs,” otherwise known as “massive online open courses.” The buzz around these platforms (think Khan Academy, Coursera) is creating a stir in higher education, as they’ve come to represent a new model of online learning (change) and the promise of quality, affordable education at scale — something that just wasn’t possible five years ago. As always, when there’s change, something new, there’s also plenty of hype, and uncertainty. No one is really sure whether MOOCs are the future higher education, or whether they’re simply in a period of being over-hyped, before inevitably settling into a supporting role — offering certificates or flair rather than diplomas. But right now, that doesn’t matter. The experimentation at this early stage is what’s important, as we try to figure out which subjects and learning styles are best suited to their platforms. To their credit, in spite of the uncertainty and their reputation for being intransigent, institutions of higher ed have begun to support and even develop their own MOOC platforms (like MIT, Harvard and UC Berkeley’s joint venture, EdX). But when it comes to actively participating in educational innovation — or at least MOOCs — it seems that few can hold a candle to Stanford. 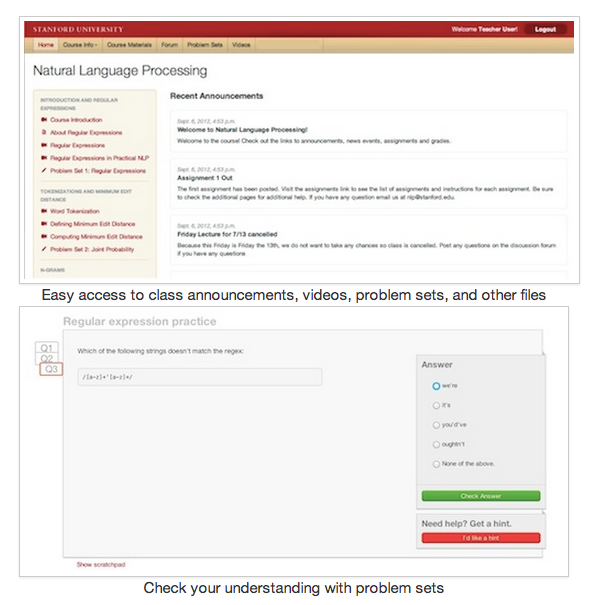 Again, while Stanford is one of many universities getting on board, the university has long offered courses and lectures online, more recently through iTunes U, and at the end of August, went so far as to create a “Vice Provost of Online Learning” to oversee the integration of web technologies into Stanford’s education. What’s more, popular educational platforms like the well-funded Coursera, the tech-focused, Khan Academy-inspired Udacity and the group-based Venture Lab all either got their start at Stanford or are currently on campus. 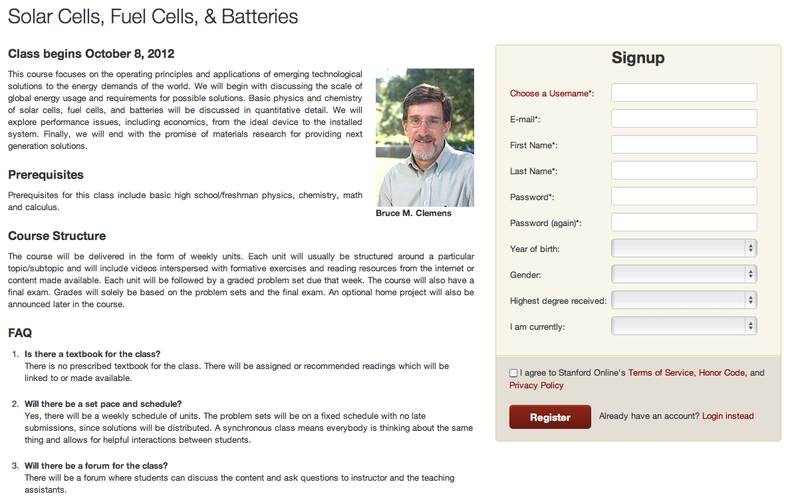 And, as of this month, Stanford has added yet another MOOC. While that may seem superfluous, Class2Go is no clone — it’s bringing a unique approach to its online learning platform. Created by eight engineers in Stanford’s CS Department, the not-for-profit service has been designed from the bottom up both for teaching and research, with a focus on portability and interoperability. To unpack that a little: When Class2Go says it’s portable, it means that it wants to be platform agnostic. Its documents are already portable, its videos already live outside its system on YouTube, its assets can be repurposed as professors see fit and the platform’s exercises and problem sets are in the Khan Academy format (meaning they’re not in a proprietary database) and can be used anywhere. In terms of interoperability, Class2Go’s website reads, “we don’t want to build or maintain more than we have to,” so it stands on the shoulders of, or relies significantly on, other services to run, like Khan, Piazza, YouTube, Python Django, Amazon AWS, Opscode and Github. Furthermore, designing the platform for both teaching and research means that the platform will leverage data to inform and evolve pedagogy, as well as to give them a glimpse into the efficacy of lessons, teaching style, tech tools, etc. But the biggest differentiating factor for Class2Go — in case it hasn’t yet become apparent — is its early dedication to building and maintaining a totally open-source platform. This means that the platform aims to be both free of cost and of pricey IP, while professors are free to contribute to Class2Go’s code and get involved in the development of the platform, as well as to collaborate with other institutions and organizations. And that’s where you start to see what might be Class2Go’s biggest appeal. A big complaint against existing platforms (and really, educational technology as a whole) is that it is more concerned with progress for the sake of progress — even if that means technology replacing teachers (the human kind) altogether. Instead, the most successful edtech platforms (and this is obviously especially true for MOOCs, given their structure) are those who truly empower teachers, designing their platforms in such a way as to optimize a teacher’s ability to teach effectively, control their content — and engage their students. The platform does this by making all content created within, regardless of type, property of whoever creates it. Professors can also take advantage of the aforementioned backend, which enables them to track student use, see how students are watching video, when they drop out and what kind of content resonates with them the most, video or slideshows — essentially creating an A/B testing platform for teachers. The other differentiating (and life-saving) factor for Class2Go is that it’s being supported by the university. Compare that to Coursera, which was lucky enough to raise a huge first round for such a young company, but still has to eventually face “Monetization Mountain.” Business models seem to have been the farthest things from mind during the development of Class2Go, and, thanks to Stanford’s support, the team can focus on building a great user experience for professors and students. Education and monetization have always enjoyed a strained relationship, and is an ever-present pressure over the oft-mission-based edtech startup. So, hopefully, being free from that will allow Class2Go to experiment in ways others may not be able to, and by becoming open source, build a platform that in the end will have greater integrity and more bells and whistles than its closed counterparts. Hopefully, Class2Go (which, by the way, is also working on mobile apps, hence the name) and the other MOOCs in its class will soon be able to move beyond the experimental phase to really begin solving the big problems in higher education. For more, find Class2Go at home here, or on Github here.